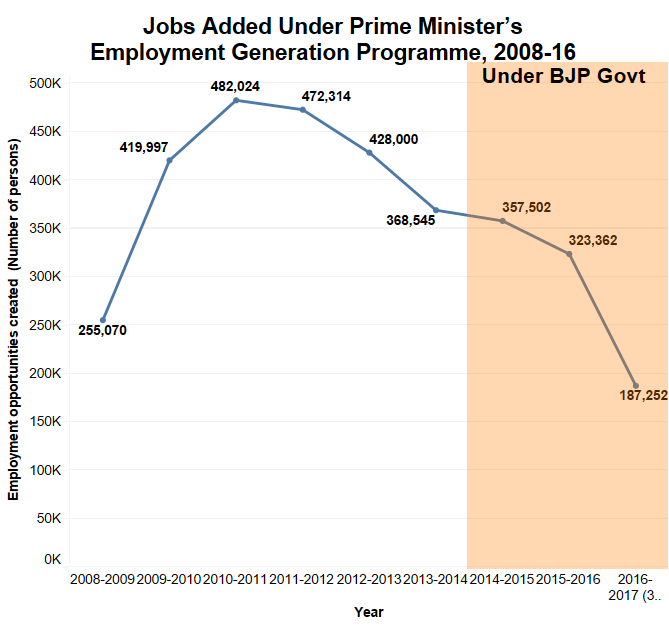 India’s unemployment rate has registered a slight increase since the Bharatiya Janata Party government began its term in May 2014, despite the government’s professed emphasis on job creation, according to an analysis of government data. 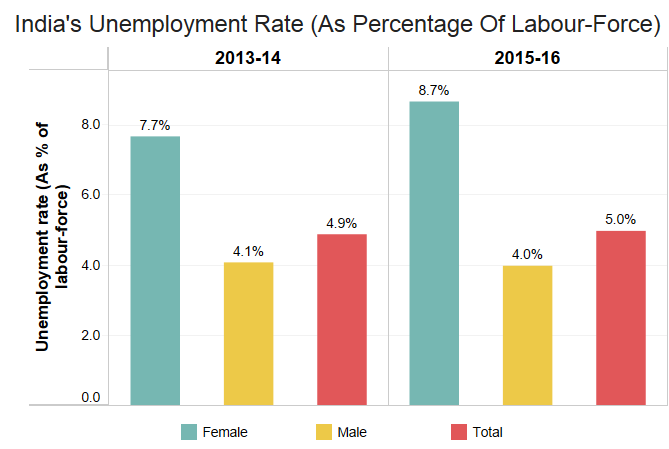 The unemployment rate in 2015-’16 was 5% of the labour force, up from 4.9% in 2013-’14, the year before the BJP assumed power. As the BJP government completes three years in office this week, IndiaSpend is analysing five of its key electoral promises – on employment, Swachh Bharat, roads, access to electricity, and terrorism. In the first part, we look at how the government has performed on job creation. At a rally in Agra in 2013, Narendra Modi, then campaigning for the position of prime minister, had said the BJP would create 10 million jobs: “If BJP comes to power, it will provide one crore jobs which the UPA [United Progressive Alliance] government could not do despite announcing it before the last Lok Sabha polls,” the newspaper DNA had quoted Modi in a November 2013 story. Based on the “Usual Principal Status” – according to which those who have spent a major part (183 days or more) of the preceding 365 days before a survey on economic activity are counted as having been part of the labour force – the labour ministry’s report on the Fifth Annual Employment-Unemployment Survey (2015-’16) said unemployment was 5%. 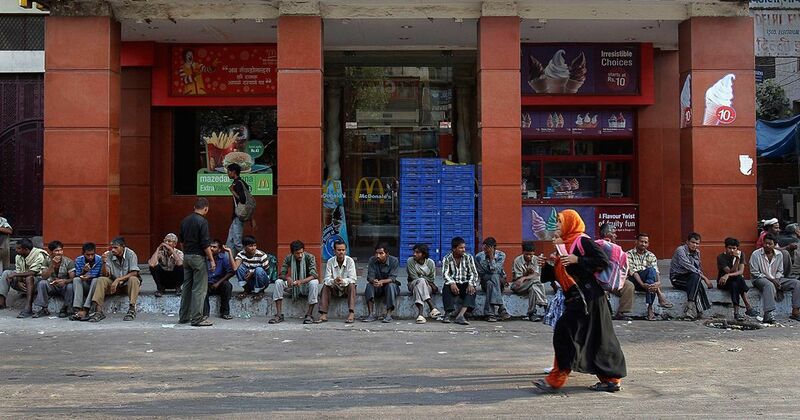 The figure for 2013-’14 was marginally lower, at 4.9%, according to labour ministry data. The survey includes workers in both formal and informal parts of the economy, as well as those working as casual workers in public works programmes. Source: Ministry of Labour and Employment Quarterly Employment Surveys. Between July 2014 and December 2016, the eight major sectors of manufacturing, trade, construction, education, health, information technology, transport, and accommodation and restaurant created 641,000 jobs, data shows, not including jobs created between January 2016 and March 2016, for which data is unavailable. In comparison, these sectors had added 1.2 million jobs between July 2011 and December 2013, according to labour ministry data. This is based on data collected by the government from non-farm industrial units that have 10 or more workers in these eight sectors. “These surveys are being conducted in selected sectors of the economy which are sensitive to the global factors and employment intensive,” a 2016 labour ministry report said. Further, the Economic Survey pointed to a shift in the pattern of employment from permanent jobs to casual and contract employment. The increasingly temporary nature of work, it said, has an “adverse effect” on the level of wages, stability of employment, and employees’ social security. “It also indicates preference by employers away from regular/formal employment to circumvent labour laws,” it stated. Source: Ministry of Labour and Employment Quarterly Employment Surveys. Note: Temporary workers include casual labour and contract workers. 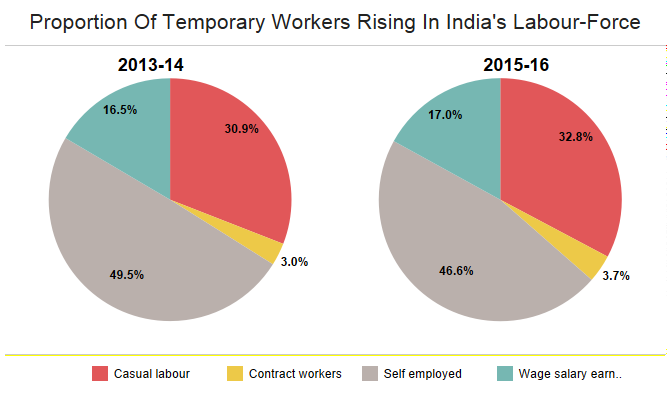 These employment surveys, conducted both before and after the BJP government began its term in 2014, do not account for a considerable portion of India’s workforce – those working in units employing less than 10 people, and those employed in the informal sector. The informal sector is estimated to have provided 90% of jobs through the period 2004-’05 to 2011-’12, according to Economic Survey 2015-’16. The number of beneficiaries of one government assistance programme, the Prime Minister’s Employment Generation Programme – which aims to generate employment in rural and urban areas by starting new micro enterprises and small projects – has fallen 24.4% from 428,000 in 2012-’13 to 323,362 in 2015-’16, according to government data. Until October 2016, the programme had created an additional 187,252 jobs, according to the latest data available. A further 15,768 people opened micro-enterprises under the National Urban Livelihoods Mission in 2016-’17, which “seeks to enhance the employment opportunities and incomes of the urban poor….” The programme was launched by the previous government in 2013 but has been continued by the BJP government. It is not clear how many jobs these micro-enterprises might have created. Source: Lok Sabha, Press release (July 2014) and Annual report 2013-14 of the Ministry of Micro, Small & Medium EnterprisesFigures for 2016-17 are upto October 31, 2016. 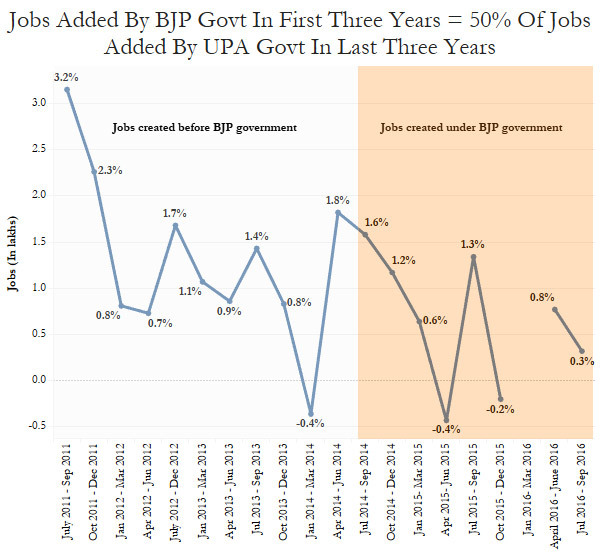 The total number of jobs created in the first three years of the BJP government, calculated by adding data from the eight major sectors included in the labour ministry’s quarterly employment surveys and data on the Prime Minister’s Employment Generation Programme until October 2016 would be 1.5 million – which is nearly 39% less than the 2.4 million created during the three previous years, based on the same data sources. However, since data from the eight major sectors for January to March 2016 as well as Prime Minister’s Employment Generation Programme data between October and March 2016 are not available, the employment figures during BJP rule might be somewhat underestimated. This is the first of a five-part series tracking the status of the BJP government’s promises three years after it was sworn in.